I’m very excited to be organising an event and exhibition on Gothic at the Library of Birmingham. With help from students, I’m putting together a day of talks on Gothic from literature to Goth culture, open to everyone and free to attend, while an exhibition will feature work from BCU students which relates to Gothic. I haven’t yet got a completed programme for the day, but below is the press release, plus the beautiful poster designed by Grace Williams, who is also curating the exhibition. If you’re interested, please follow us on twitter @gothicinbrum, find us on facebook (https://www.facebook.com/groups/843422549049077/?fref=ts) or look at the blog: http://www.gothicinbirmingham.wordpress.com. Library of Birmingham turns Gothic for an exhibition hosted by Birmingham City University. Press Release by Holly Barry, student in the School of Media. 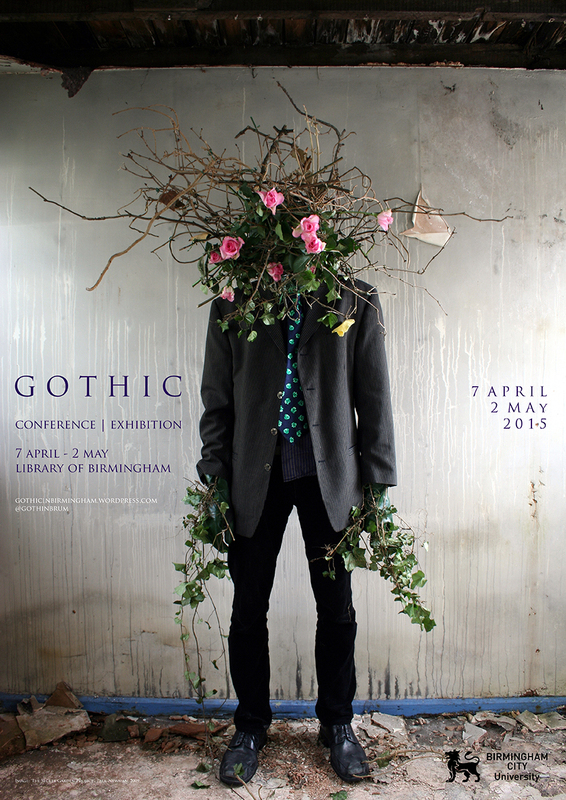 On Saturday 2nd May 2015, BCU will be hosting an Interdisciplinary Gothic Event at the Library of Birmingham, showcasing all things Gothic. There will also be an exhibition, running from 7th April – 2nd May to accompany the main event, both organised by Dr. Serena Trowbridge from the School of English with support from second year English student Bex Price. The event will consist of several talks about different areas of Gothic – fashion, architecture, literature, photography and more. The exhibition is being curated by Grace Williams, a PhD student in the School of Art, and will include a wide range of works by BCU students. Dr. Trowbridge’s book, Christina Rossetti’s Gothic, which was published in 2013, grew out of her Ph.D. thesis which she completed at BCU. As well as the exhibition itself, there will also be a blog dedicated to this event where there will be regular posting of news, updates and any written work revolving around the Gothic theme. You can read it at www.gothicinbirmingham.wordpress.com, or find more information on twitter @gothicinbrum. There is also a facebook group: https://www.facebook.com/groups/843422549049077/ for contributors and attendees. The event will be open to anyone and admission is free.